← What are you prepared to lose to get a university degree? What can we learn from Bubba Watson? Bubba who? Unless you are a golf lover, you probably have not heard this name before. Bubba Watson is an American professional golfer. He just won the 2012 Masters Tournament after a wonder shot that many considered it ‘almost impossible’. It was his first major title. Bubba is known for the length of his drives. He is one of the few people who can hit the ball over 350 yards (320 metres approx). He is also known for never having done any golf lessons in his life. He is entirely self-taught. He has never watched a replay of his swing on video either. So what can we learn from him? To answer this question, I’ll use the Head-Heart-Hands framework influenced by a book I read recently by Ken Blanchard et al. 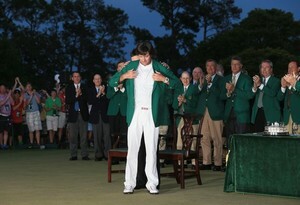 Bubba is wearing the green jacket. Heart: Bubba doesn’t need only to see the shot in his head but he also needs to feel it. He follows his own instincts. And when he does, he is great. He is also very passionate about golf. He has fun with it too. Check his YouTube videos smashing lettuce heads and pumpkins with wooden clubs! Hands: He started playing golf at young age. He has been practising all the time. Every time he goes out, he hits the golf ball as hard as he can. His technique is unconventional but it is working for him. Bubba became very successful despite not having formal training in golf because he loves what he is doing, he knows what he wants to achieve and he is committed to do it. Working hard to make it happen. What I like most about Bubba is that Bubba wants to be Bubba. He is authentic. He just wants to be himself. In a professional sport with so much at stake, this might require more courage than we think. Well done Bubba! This entry was posted in Before I apply, Career Advice and tagged 2012 Masters Tournament, Bubba Watson, Golf, Head-Heart-Hands. Bookmark the permalink.